March 29 – Canadian Victor Montagliani has won a second term as president of the North and Central American and Caribbean confederation Concacaf. The congress in Las Vegas, US, also saw Sonia Fulford given another four-year term as Concacaf’s women’s rep on the FIFA Council. 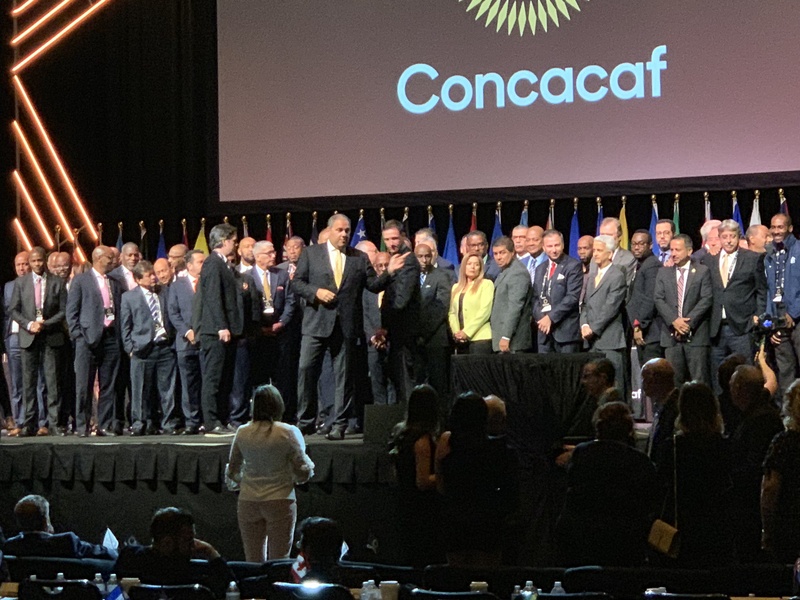 Concacaf Congresses these days are a very different animal from the crisis congresses of 2016 when the confederation had to push through a series of reform packages or risk being blown away by the winds of corruption that had been brought to light by the US Department of Justice indictments of 2015. It is a past that Montagliani is not afraid to ‘own’ as president of the confederation, secure in the knowledge that Concacaf is now in a very different place and operating at a very different pace. Montagliani took over as president in May 2016 to fulfil the remaining three years left on the term of disgraced former president Jeff Webb. Since then, driven by his ‘One Concacaf’ mantra, he has presided over a rebuilding of the confederation. It hasn’t necessarily always been a popular process, and in terms of the Caribbean it has at times been brutal, but the result today is a much slicker operation driven at last by an expanded competition calendar. “The landscape is very different from when I was elected in 2016,” said Montagliani, who this time round was unopposed in the election. “In 2016 we all stood together in the face of adversity and criticism. In 2019 we are getting praises. Today we are not talking about governance reforms but focussing on football. We have achieved more than we could have imagined…Back then we were thinking in terms of seconds, minutes and hours. Now we have earned the right to think beyond one day at a time,” he continued. Crucial to the change was to establish a political unity amongst member nations to enable the competitions to be proposed and established. No-one in Concacaf is pretending it was an easy process to find common ground and Montagliani spoke of the plentiful doubters, but he had nothing but praise for the ‘Concacaf family’ in overcoming misgivings to provide that unified platform to progress. A brand new Nations League that everyone expressed excitement for, more regional youth competitions, a stronger Caribbean national team structure, a revamped and expanded Champions League and the growth to a 16-team Gold Cup are all significant progressions. And with these competitions has come a change in message from ‘One Concacaf’ to ‘Love for our game’. Certainly an emotional Montagliani was feeling the love of his member associations as he accepted his new term of office. Infantino then went on to talk about what his FIFA is bringing to Concacaf. Not surprisingly it was money talk with Infantino saying FIFA would be investing $74 million in development in the Concacaf region. This money promise came after Infantino again thumped the tub of his own financial success having taken a “toxic” association (his words) that had a reserve of $1 billion in 2015 to an association with a reserve of $2.7 billion in 2019 “to reinvest back into the game”. With so much money sloshing around FIFA the question might be asked as to why Concacaf’s 35 FIFA members aren’t getting more than $74 million. What Concacaf is getting will be more FIFA members, and in the current political environment that will be more votes for Infantino. Concacaf has 41 member associations but only 35 at FIFA. Infantino indicated that some of the six that aren’t FIFA members were on track to become members – most likely at FIFA’s own Congress in Paris in June. While a few more FIFA members from Concacaf are unlikely to stretch the money money mountain too far, the confederation’s own finances are in pretty good shape. Championing their first-ever 4-year budget forecast, revenue is expected to grow by 40% over the 2019-22 period to $407.3 million, driven largely by the new Nations League and expanded Gold Cup and club competitions. Breaking that revenue down, 70% is expected to come from broadcast revenue, 10% from FIFA and 10% from ticket sales and 7% from sponsorship. For 2019 Concacaf was forecasting a $4.1 million surplus and for the four-year period to breakeven but to be in a positive cash position. The sun was shining on a bright spring day in Las Vegas. And Concacaf was in a very happy place.